Created by James Law, the Cybertecture Mirror presents users with a wealth of information while looking at their reflection including weather and news, social network feeds, streamed internet TV, personal health information and can even act as a personal exercise. It has a 32-inch LCD display that is fronted by a 37-inch fog-resistant mirror, running on a Linux-based proprietary operating system. It will be connected to the Internet via Wi-Fi or LAN. 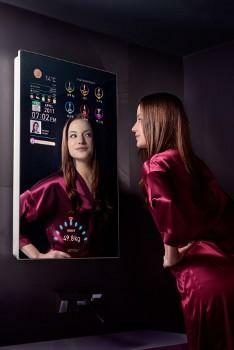 The smart mirror comes with a wireless peripheral sensor pad to help in calculating and displaying health information such as percentage of body fat, muscle mass, bone mass and body weight. Users can interact with the device via a free smartphone application or an included handheld remote, with an on screen virtual keyboard for text input. Up to 20 password-protected profiles can be saved on the 8GB of internal storage. The 32 x 20 x 3.14-inch (815 x 507 x 80 mm), 55 pound (25 kg) Cybertecture Mirror also sports audio and video in ports and built-in stereo speakers with 3W RMS output, and a 3.5 mm headphone jack. The Cybertecture Mirror costs from 3,600$ to 7,700$, depending on product configuration and project sales for bulk installations in hotel and apartment towers.